Jennifer is a close ally of State School Superintendent Janet Barresi. She was Barresi’s first campaign manager, first chief of staff, and oversaw the creation of Barresi’s squadron of evil winged flying monkeys. She also pulled a Barresi in 2011 and referred to educators as “dirtbags” on Twitter. She’s now doing work for the Barresi campaign through her firm Jennifer Carter Consulting. I’m telling you this because Jennifer’s husband, Ray, is a former PR flack who just happens to be an editorial writer for The Oklahoman. For a living, he regurgitates conservative talking points, protects the newspaper’s friends and allies, and attacks and destroys their enemies. They conclude by expressing disbelief that anyone would vote to stay the course. So there you have it, The Oklahoman thinks you should vote for Janet Barresi because… she’s an abrasive, alienating, bridge-burning tyrant lady who wants to improve education for all students? Uhm, can’t we find some nice qualified person who wants to improve education, too? In case you care, the answer to that question is “Yes.” Just don’t expect the Oklahoman editorial writers to tell you about it. And that, my friends, is why I have a list. Looking back upon the first half of the Top 10, I see trends. For misinformation, see #10 and #6. For incompetence, see #9. For a combination of those two things, see #8 and #7. Today’s post is about a topic that amounts to part misinformation, and part bullying – which will be a running trend throughout the top five. I feel I start a lot of paragraphs with the clause, One of the most outrageous/ridiculous/disingenuous things she Barresi has ever said was…. Well that’s where we start tonight – with a line that she has repeated and revised may times since November. To my knowledge, the first iteration was at the candidate forum in November that I often reference (because it is so rich with material). She told the audience that 75 percent of all special education identifications are incorrect; that the school just hasn’t taught children to read. Not only is this complete nonsense; she has to know it is. Sometimes, it’s actually 50 percent. Sometimes it’s a vague number. Whatever it is on a given day, she tends to repeat some version of this line every time she discusses reading. This statistic is supposed to be evidence that she knows something that we don’t know. It’s a refrain with no intent other than to perpetuate a lie – public schools are failing – and to do so using special education students as a prop. Few things anger me worse than mistreating students on an Individualized Education Program. This includes dismissing their needs as well as dismissing their abilities. For years, schools have worked to curb over-identification of special needs students, knowing that getting that label early can lead to a life of low expectations. At the same time, when students are struggling to the point that their education suffers – whether it be for cognitive, physical, emotional, or any other set of reasons – we would be wrong not to accept the fact that an IEP is necessary. Statewide, schools have held steady at an average of 15 percent of students on an IEP for years. That doesn’t mean we can’t find instances of over-identification or under-identification. After all, Cottonwood, the district that Barresi’s executive director of literacy led for years, has one of the highest special education identification rates in the state. The belief that we don’t know how to place special education students correctly is a terrible indictment of teachers in the early grades. Most students placed on an IEP start to receive services before third grade. With this made-up statistic that Barresi tailors to her audience on any given day, she calls into question the competence of every single teacher children have before age eight. This is worse than the learning to read, reading to learn trope because repeating the lie as she does undermines the work we do with some of our most vulnerable students. As I’ve repeated on this blog and on social media, the exemptions in place for special education students under the third-grade retention law do not provide much of a safety net. This is one of the shorter posts of my countdown, but honestly, it doesn’t take a thousand words to remind readers that Janet Barresi does not understand special (or any other kind of) education. Rob Miller explained this well last week in one of his Really posts, hitting several points that I will again raise as we approach the top of the charts. In case you’re wondering, the number one reason to vote Janet Barresi out of office in nine days is that she is awful at her job. Furthermore, she’s surrounded herself with people who are awful at their jobs too. That’s not how the countdown works, however. Apparently, I’m supposed to list specific ways in which she is awful at her job. As I do, feel free to grade this post for each of the five analytical writing traits separately. Hopefully I’ll get a 4.0 for coherence. On the other hand, I’ve written a lot this month in a short period of time. You can just give me a holistic score if you want. Pretend you work for CTB. If there’s one thing I think Barresi has right, it’s the fact that reading is the most important skill our children learn. Within that topic, we disagree over everything else. Her mindset regarding reading instruction is that if a student can’t read after four years in the classroom, the school is to blame. Her mind is set. There is no room for argument. Since the legislature updated the Reading Sufficiency Act in 2011 to include mandatory third grade retention that would take effect this school year, the SDE has made preparing for this moment a primary focus. 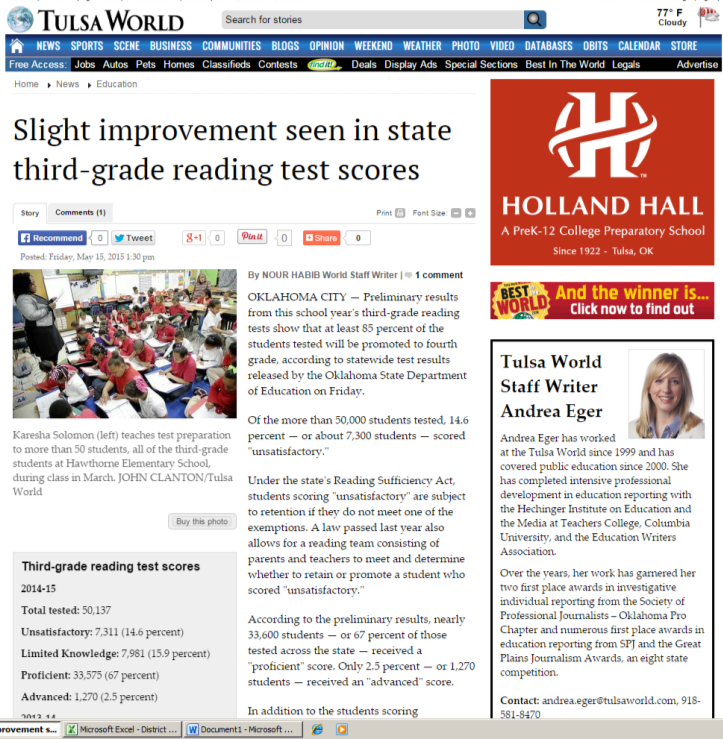 At the same time, implementing TLE and CCSS were each a major focus, diluting the attention given to this effort. Still she found some federal money for one year and some Activities Budget money a second year to employ 60 REAC3H coaches, who she said were the cornerstone of the state’s efforts to prepare teachers and students for the test. In the meantime, with a major assist from the Oklahoman, Barresi has taken every opportunity to show that only her opinion matters. She has controlled the narrative with talking points straight out of Florida, faulty research, and a fundamental misunderstanding of what the tests in Oklahoma measure. There are several points in time that would make sense for starting this discussion. For this piece, I’m going to begin with a campaign forum at which Barresi spoke in November, then hit several key moments that have happened since then. During this forum, Barresi was debating 1994 and 1998 Republican state superintendent candidate Linda Murphy. At the time, Murphy sounded like a potential candidate herself. At one point, a parent asks her a question, and Barresi defends the retention law. Barresi fields an emotional question from a parent of a stressed out special education student. She responds by digging in on the third grade retention law. Again she blames school districts, claiming that they waited until this year to act. She conveniently forgets two facts. First is that until August, school districts had received no guidance from the SDE about how to take the six good cause exemptions written into the law from statute to action. Once again, here is the process: Statute to Administrative Rule to Guidance for Implementation. For all of the training that school districts have received (or not received, depending on the REAC3H coaches), in assisting third graders, the real trick is knowing how to enact the law. The second fact is that school districts received no RSA funding last year and still wait to receive their notices of funding for this year. Schools continue working with students and waiting endlessly on the SDE. The first year the SDE had the REAC3H coaches, they were working their way into the schools they served, between periods of receiving training themselves. Not until the beginning of the 2013-14 school year, however, had districts received anything that resembled official guidance from the SDE. This past school year, the coaches probably spent almost as much time helping their districts with paperwork as they did on training. The mindset of the SDE seems to have been that they would spend a lot of money and hope that what they were buying made its way into schools. As I’ve written previously, the REAC3H coaches turned out to be a big help. The problem is that they could not reach all the teachers in all the schools in a meaningful way. Sixty people can only be in so many places. 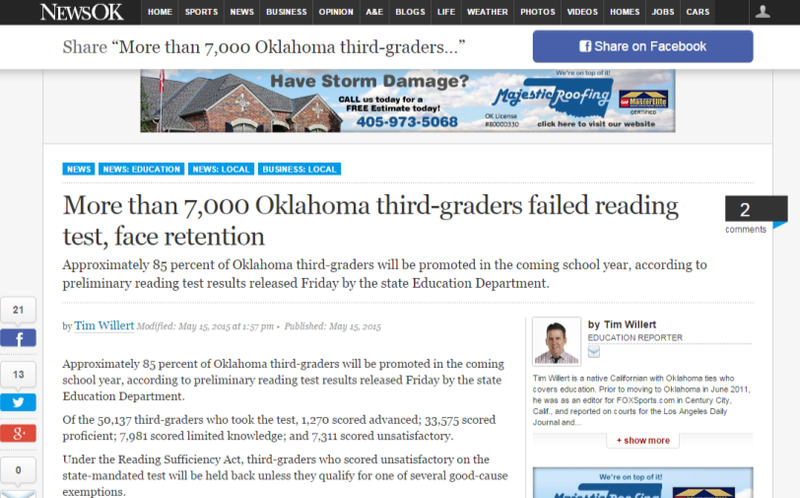 By January, the SDE had sent forms for districts to use to predict how many third grade students would score Unsatisfactory on the reading test. Shortly thereafter, she held a press conference and would only let members of the media ask questions. In fact, when a parent tried to have a word with her, she shut that parent down, asking, “Are you with the media?” She also tersely told those in attendance that “the time for debate is over.” That’s the Barresi way – always shut down dissent by putting her fingers in her ears. This was also the first time I can remember Barresi using the trope about fourth grade being the age when “children transition from learning to read to reading to learn.” It’s a hell of a sound byte, but it’s completely meaningless. As reading guru Claudia Swisher points out all the time, we never quit learning to read. As for children still in the process of learning to read, they are still using their emerging skills to aid in other learning. In truth, every skill you gain in decoding information assists you in every other academic endeavor. 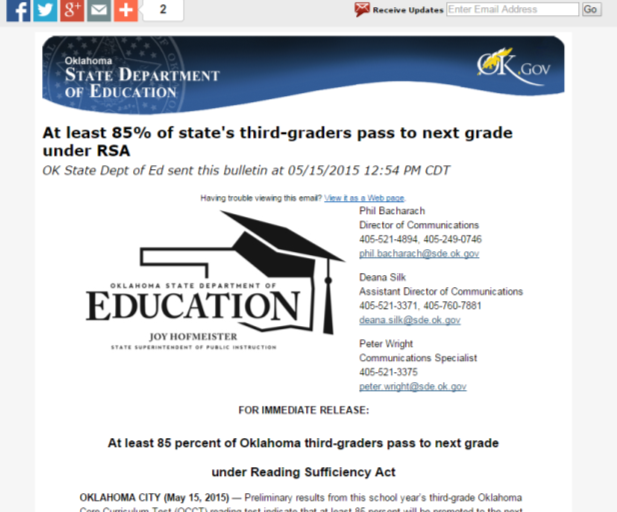 As you are well aware, this is a critical time for the Reading Sufficiency Act’s third-grade reading requirement. I know that those of you teaching K-3 are working hard to give your students the gift of literacy, and I have seen impressive reading plans in districts large and small across Oklahoma. With the OCCT testing window only a month away, I wanted to address some common questions about how to prepare for RSA today and in the months ahead. As outlined by the RSA, by this point you already have identified struggling readers through benchmark assessments and have notified parents of the children who are struggling. In the coming weeks, keep doing what you do best — explore the fundamentals of reading with those students using whatever the techniques or resources you think will work most effectively. If you need assistance from one of our REAC3H coaches or the literacy department, help is only a phone call away. Talk to parents or guardians. If you can reach out to families — especially those where education is not a priority — with accurate information about the RSA and the importance of literacy, you could help spark an entirely new future for those children. I really took issue with that third paragraph. Schools had been reaching out to families, and yes, there are a lot of households where education is not a priority. When it came to having information about the RSA, however, that wasn’t the line of demarcation. I have had many conversations with parents holding advanced degrees in which I had to carefully walk through each of the six Good Cause Exemptions. For many, disappointment in the provisions for special needs students was apparent. I want to thank those of you who have taken the time to write to me with your thoughts and recommendations. It helps those of us at OSDE make appropriate adjustments in the program and in the supports we provide to you. Also, thank you to all of you who have attended our trainings. I hope you have found them to be of value. Finally, I want to thank you for the work you do for the children of Oklahoma. Your steadfast commitment and professionalism are a testament to the greatness of teaching. My prayers are with you and for you and the children you faithfully serve. These are the same teachers she blames in the letter. These are the same teachers who fought for changes to the RSA law that Barresi would later call outrageous. Yes, teachers, you’re both a disappointment and an inspiration. That’s how this works. A child who scores unsatisfactory on a third-grade assessment can’t read and comprehend ‘Horton Hears A Who.’ But they’re being sent into fourth grade where they are expected to read and understand “Little House on the Prairie. Back to Horton and Ma and Pa Ingalls. She identifies Horton as a first grade level, and Little House as a fourth. Jason James, who has written extensively about the third grade reading-language arts test, points out DDS Baressi’s two examples are really closer in grade level than she realized. Not a surprise…she is a dentist, not an educator. Moving ahead to May, the SDE announced that a hotline would be established to help parents, teachers, or anyone else who called to understand the test scores when they were released. Then, inexplicably, the SDE released the scores to the media before schools could get onto the CTB server and pull them. Worse yet, parents could see that their child’s school had a certain percentage of students who received an Unsatisfactory score long before the school could notify them of their child’s status. We were just getting going. Next came the legislature passing HB 2625, which allows for committees to decide whether students should be retained. Then came the governor’s veto. Then came the overwhelming override (without debate) by both the House and the Senate. 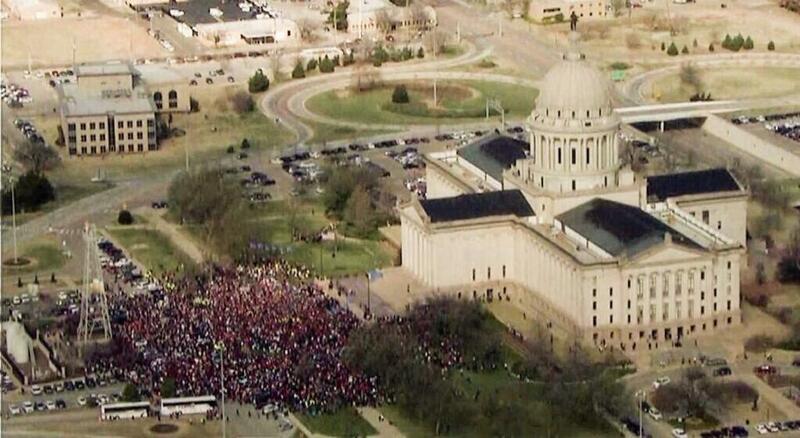 Finally, we had another occasion for one of Barresi’s petulant outbursts. When interviewed about the override, she called it pathetic and outrageous. Since November, we’ve watched and fought as the state superintendent has made crazy statements about the most important thing we teach children. She still thinks our third grade reading test (which is really more of a language arts assessment) can detect grade level. It can’t. She thinks giving parents a say in retention decisions completely guts the law. It doesn’t. She has spent every day of this campaign stomping her feet about the importance of reading. Sometimes, when the light is just right, you can even see the steam coming out of her ears. She blames the education establishment, when really, it was parents who provided the momentum for HB 2625. As a side note, I’m still curious as to why overwhelming support for this bill held no sway over the governor as it did with HB 3399. Barresi, when it comes to any education issue, digs in completely. There is no compromise. If a great number of teachers who cumulatively have thousands of years of experience tell her that their time in the classroom has shown them something that she doesn’t believe, she falls completely deaf. She is an ideologue first, a politician second, and an educator never. The only thing her drive for mandatory retention has accomplished is that it brought fear into the classroom. Now that I look at that statement, I probably had this a couple of spots too low at six.